Teardrop campers compared with Vanlife, traditional Rv's & Pop-top Tents. 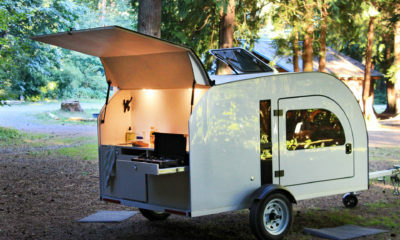 Modern day camping has entered a new Booming era. No need for an academic researcher to spend a semester proving it. Just grab some popcorn, head onto Instagram or Pinterest, and watch the battle of adventurers take place. The Internet pitfall in search of the ultimate nomadic lifestyle is endless. 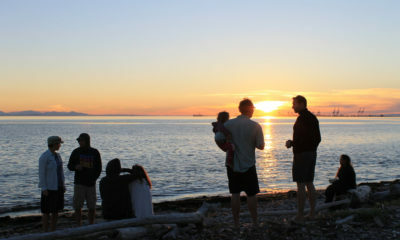 The adventuring lifestyle trend is growing, and the marketed mobile accommodations are multiplying. Teardrop campers, ultralight tents, camperized vans, pop-top campers and RVs are all gaining popularity and feeding one dream: TRAVEL FREEDOM. While all of them are attractive at first, Which one suits your lifestyle best? Where do we stand with DROPLET in comparison with other market alternatives? From Vanlife to Teardroppin’, here’s a basic run down on the cost, limitations and advantages of each general concept solution. I’ve always been fan of camper vans. I looked at Westfalias, Sprinter vans and Delicas with envy for many years, and I even used to own a Chevy Astro for a few happy years of ski-bumming, crashing in empty parking lots or on the side of the road, eating oatmeal and granola by the open backdoor to refuel before my next adventure (Good ol’ days). Here’s what I’ve found about Vans: the two major advantages of Vanlife: Anywhere you park it becomes a potential discrete campsite for the night. Also, if the weather goes south during your trip well… You’re still much happier inside it after a few nights than you’d be in a soaked up tent. Initial Cost: $$ Unless you are looking for an old beater on Craigslist, a new or used camper van in great condition costs a pretty penny. If you buy a cheap van, get ready to get your elbows greased up. 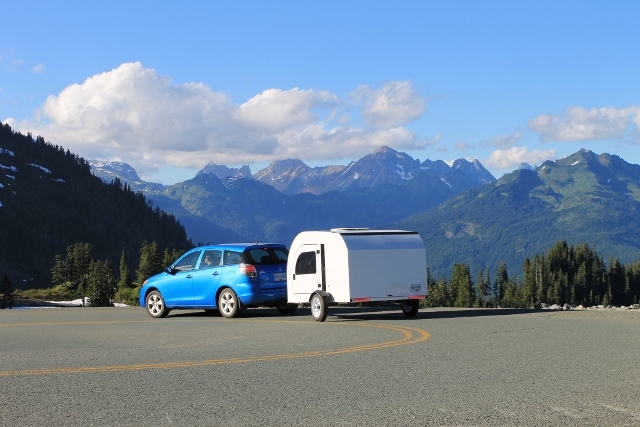 Camperizing a Van is also a costly endeavor, both on resources and time. Running Cost $$ Repairs aren’t cheap, they will consume more than your everyday car: rares are the vans which consume less than 12L/100KM. If you also use your van as your daily vehicle, the overall cost of running it will add up over time. Usability 7/10. If you cook inside your van, at best, the cooking space will be tiny. Unless the van has a high top, headroom will be tight and moisture ventilation never powerful enough. If you cook inside with lots of curry and hot spices, don’t expect your van to smell any other way afterwards. 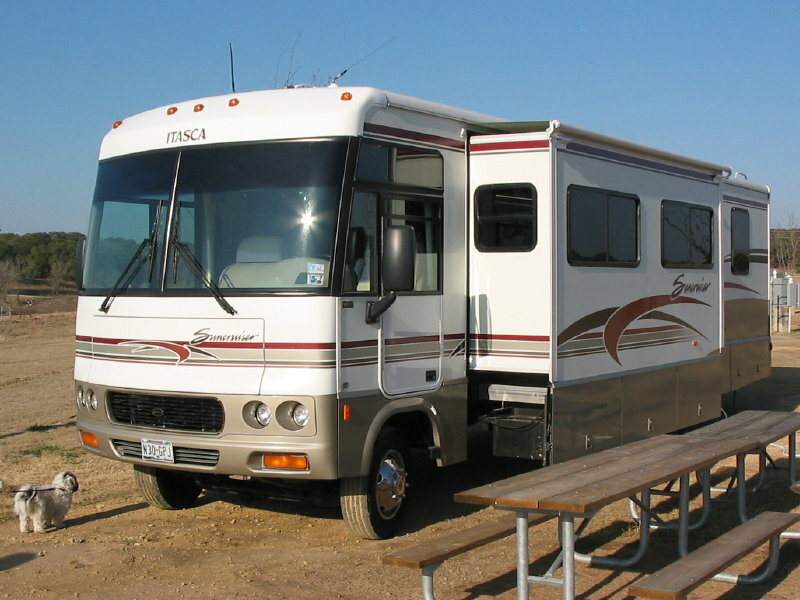 Initial Cost: $$$ RVs are awesome for road tripping with a group of friends or a family. Reduce the amount of people below 4 and the operating cost gets out of hand quickly. Running Cost: $$$ RVs/large trailers with a truck are pigs on gas. If you think driving them on flat is bad enough, try taking them up a mountain road. You’ll see your preciously saved up dollars go by the minute. Usability 5/10: While luxuriously comfortable, traditional RVs are limited as to where they can go. They REALLY shouldn’t go off-road ever (not even on a friendly FSR). Bulky and heavy, it also takes awhile to adjust to driving and parking them. 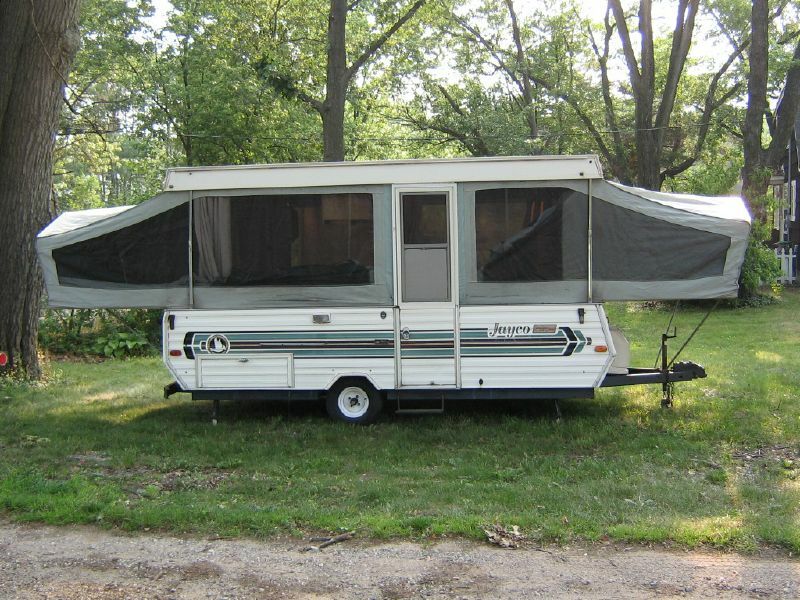 A bit more of a niche, It is much more affordable than an RV, and a definite upgrade from a tent. That is, until the timing of your trip coincides with crazy winds and undesirable rain storms. If the weather Gods are against you, be prepared to battle when setting it up in the wind. Parking and maneuvering takes a bit of practice in comparison to driving a regular vehicle with no trailer, but it’s easy to get used to it. For those seeking all-season camping options, Insulated teardrops with a rigid shell like DROPLET, or a well-built camper van a high roof and no pop-top would be best. Running Cost: $ Poptop tents are light and roomy. It’s a decent affordable option for summer camping, but not ideal for all-weather camping, or all season camping. Usability: 5/10 Pop-up trailers, while light, aren’t luxurious. Durability is also sometimes questionable, with the inside getting moldy quickly if not well looked after. If you’re only camping spring and summer, and interior space and price remain your two dominant criteria, pop-tops are a great alternative option to consider. A great versatile option, perfect for those who already have an everyday vehicle. Obviously, we are biased, but we still think it is one of the best compromise for a viable, compact and cost-friendly solution on the longer term. Tie it to your small/medium sized car, and you got yourself a luxurious resting pod with a sheltered kitchen following you. The initial cost upfront is almost on par to that of a second hand Van, but the gas saving over time will add up. 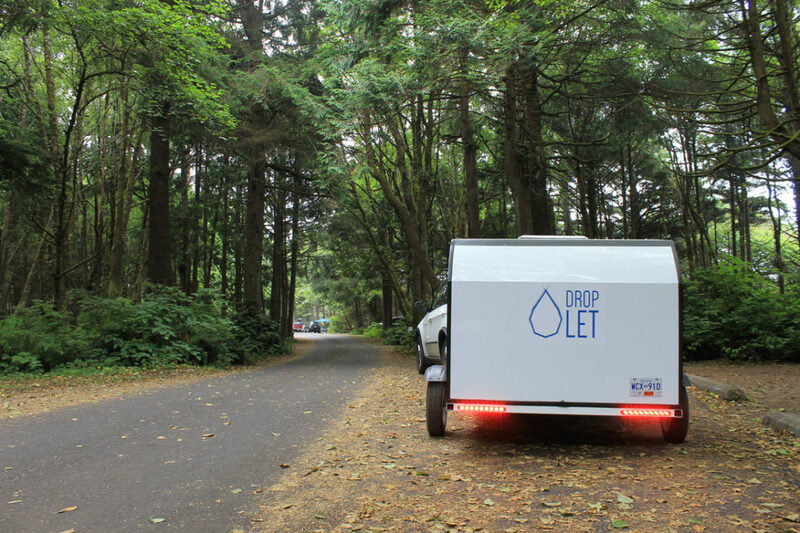 Initial Cost: $$ Similarly priced to a second-hand Van in good shape, Teardrop campers such as ours (DROPLET) offer a significant added comfort compared to a tent, while saving the precious space of your car trunk for gear. Running cost: $ Our measurements with Droplet showed that the added weight and drag ~adds roughly an extra 1L to 1.5L/100KM on the FWD 2009 Toyota Matrix with Droplet. That’s still below 10L/100 fully equipped. Aside of a mild clean-up once in awhile, no serious maintenance needed. You won’t even suffer from any unwanted smells at night from cooking or drying gear. Your bedroom stays dry and clean. Furthermore, cooking in the sheltered space of Droplet with a dual stove burner is safer, and more cost efficient than an inbuilt cooking system inside a van or an RV. Usability: 8/10 Driving with a towing trailer takes a bit to get used to, but more often than not, we have to remind ourselves that we are actually towing a charge. The turning radius remains the same. Backing up is a bit more interesting, but spending time practicing in an empty parking lot at first will make it a breeze in no time. Resistance to the weather is on par with RV’s and Vans, at the exception that a smaller space takes less to maintain a pleasant temperature inside. 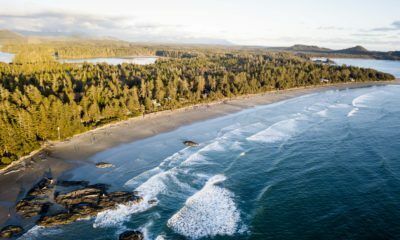 A camping and surfing trip to Tofino in the rain no longer has end prematurely with your gear, tent and clothing soaked and miserable. With a small electric heater in the back, you get to step into a pre-heated pod before even snuggling under the blanket, or inside your sleeping bag. Tiny from the outside, spacious inside. If taking a full family on a camping trip with nothing but a small Teardrop camper could show itself ambitious (bring a spare tent! ), You will find yourself having ample space inside, even if like Pascal, you measure 6ft5. 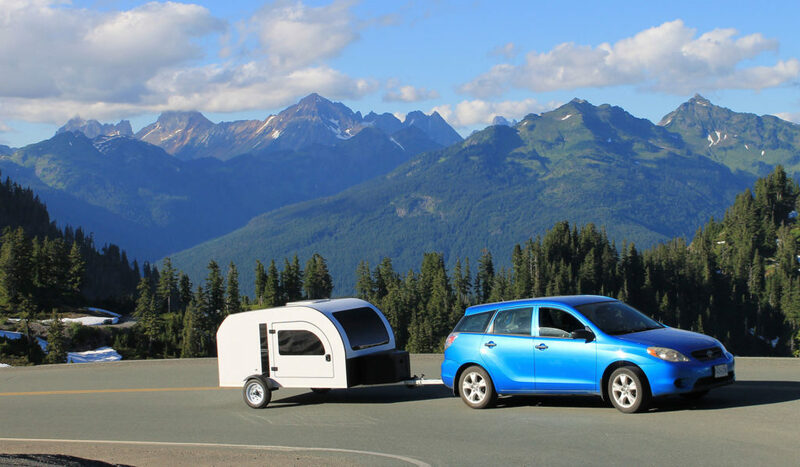 Teardrops look tiny from the outside, but cleverly designed options offer a great sense of space inside.